A graphic guide to ornaments of 20th century building envelopes. 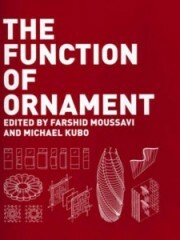 Rigorous drawings of iconic projects unveil the function of ornament as the agent for specific affects, dismantling the idea that ornament is applied to buildings as a discrete or non-essential entity. Each case exploits specific synergies between the exterior and the interior, constructing an internal order between ornament and material. These internal orders produce contemporary expressions whose affects are resilient in time.